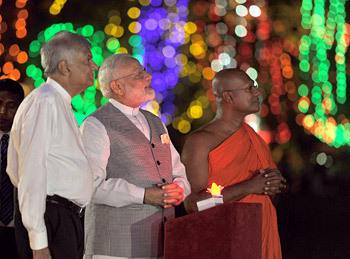 When Sri Lankan Prime Minister Ranil Wickremesinghe came to India on a 5-day visit in April 2017, he had reiterated the invitation to Prime Minister Narendra Modi for visiting Sri Lanka on occasion of Vesak Day celebrations commencing May 10. During PM Wickremesinghe's visit, both he and PM Modi had then welcomed the memorandum of understanding (MoU) on cooperation in economic projects that was signed after the meeting between Mr Modi and Mr Wickremesinghe; the MoU outlined the agenda for bilateral economic cooperation with both sides expressing their commitment to ensuring that this mutually beneficial agenda is expeditiously implemented. Both sides had also expressed hope for early conclusion of the ongoing negotiations on the economic and technology cooperation agreement. India welcomed Sri Lanka co-sponsoring the Resolution 'Promoting Reconciliation, Accountability and Human Rights in Sri Lanka' at the United Nations Human Rights Council (UNHRC) in March 2017, expressing hope that recommendations on the reconciliation would be completed within the stipulated timeframe of two years. Both countries had also discussed the issue of treatment of fishermen. Vesak Day, also known as Wesak or Buddha Day, is a traditional holiday celebrated annually on the full moon of the ancient lunar month of Vesakha. It is celebrated by Buddhists and usually falls in May or early June. This was the first time the UN Vesak Day was being held in Sri Lanka. The theme this year was 'Buddhist teachings for social justice and sustainable world peace.' This was PM Modi's second visit to Sri Lanka, first one being in 2015 when both countries had signed four agreements. PM Modi's speech as Chief Guest at the UN Vesak Day celebrations in Colombo included: Vesak being most sacred; a day for humanity to revere the birth and enlightenment of Lord Buddha; a day to contemplate the ten perfections; India's key national symbols based on inspiration from Buddhism; spread of Buddhism from India to all corners of the globe; world indebted to Sri Lanka for preserving some of the most important elements of the Buddhist heritage; from August 2017, Air India to operate direct flights between Colombo and Varanasi; India committed to the economic prosperity of Sri Lanka, will continue to invest in driving positive change and economic growth to deepen mutual development cooperation. India's development cooperation with Sri Lanka presently stands at US$ 2.6 billion. Lord Buddha's message is as relevant in 21st Century as it was two and a half millennia ago; biggest challenge to sustainable world peace today may not be from conflict between nation states, but mindsets, thought streams, entities and instruments rooted in idea of hate and violence - menace of terrorism is concrete manifestation of such destructive emotion. PM Modi also inaugurated a hospital in Dickoya in Central Province of Sri Lanka, built with Indian assistance, and addressed large gathering of Indian Origin Tamils at Norwood, in the presence of the Sri Lankan President, Sri Lankan Prime Minister, and a large number of community leaders. During the address, Modi spoke of the contributions of the Indian Origin Tamil community to Sri Lanka, and the long shared heritage between India and Sri Lanka. With the aim of dominating the Indian Ocean Region (IOR) and restricting India's strategic space in South Asia, Sri Lanka has been in China's crosshairs; China making every possible move to pull Sri Lanka into its gravitational sphere — away from India. As with some other countries China has applied financial largesse not only to the target particular country but also for building individual and groups that do China's bidding for money. At times, Chinese investments are so huge and repayments so difficult that China manages to extract the price in strategic terms. China aims to develop Hambantota as SSBN base for Chinese Navy — one amongst planned 18 including Gwadar and Djibouti ringing the IOR. That China loses no opportunity to undercut India was again proved when coinciding with PM Modi's visit, China sought permission to dock a submarine in Sri Lanka. However, Sri Lanka denied permission and the Chinese submarine was observed proceeding to Pakistan. China's ambition to strategically dominate Sri Lanka suffered a setback in January 2015, when Maithripala Sirisena was elected as President in preference to two-term President Mahinda Rajapaksa, latter known for his Chinese leanings. So, it is not surprising that just before PM Modi's recent visit, the Sri Lankan joint opposition called for black flag protest during Modi's visit alleging government was "trying to sell Sri Lanka to India", with particular reference to Trincomalee, even as no agreements were planned to be signed during Modi's visit. In January 2017, Sri Lanka's Minister of Ports and Shipping, Arjuna Ranatunga told media there is speculation that a major country in South Asia (read India) would lose businesses to Sri Lanka when construction of a canal with the Chinese funds in Thailand is completed and that country may be behind the opposition to the development of Hambantota by China. More recently, Admiral Jayanath Colombage, former Sri Lankan Naval Chief and Director of Colombo's Centre for Indo-Lanka Initiatives, stated that at the leadership level, the India-Sri Lanka relationship hasn't been better ever, which can be a driver of economic development in the region, the challenge being to translate this from leadership level to action. He also explained that in 1987, Indian Oil entered Trincomalee, commenced using 15 of the 98 oil tanks fo British era, and that Sri Lanka plans to activate balance tanks through tie-up with India. More significantly, he said Colombo is fully aware of India's strategic sensitivities. He was also of the view it would be best if an Indian conglomerate or company builds the east terminal of Colombo Harbour. There is no doubt that India-Sri Lanka cooperation would be beneficial for the entire region. In terms of development projects on foreign soil, India could take a cue from China wherein Chinese government invests only a small part while private companies take on the major share of investment — like in case of CPEC. Perhaps big Indian conglomerates need to examine the concept of Corporate Regional Responsibility (CRR) akin to Corporate Social Responsibility, even as CRR would be purely business venture.